The cool, crisp air wisps changing leaves from the trees one by one. It starts slowly, and suddenly, fall overtakes your senses. Let the inspirational colors of the season motivate your workout and make it easier to breathe as you progress your way uphill or push through your last rep. The cooler temperatures keep you alert and make it less likely for you to overheat. Or if you prefer an indoor workout, you finally don’t have to feel quite as guilty for not getting out and taking advantage of the warm weather! Try out something new this fall with these unique exercises for the transition toward fall. Explore the changing landscape by water and get your workout in with a kayaking adventure. Pick a beautiful weekend day and get ready for an upper body workout you never had before — kayaking targets your arms, shoulders, abs, chest, heart, and back. As you row, your trunk moves in counter-rotation and rotation increasing the need for your spine to align and find balance, strengthening your core and other upper body areas. As you dip the oar back into the water, your pectoral muscles stabilize your shoulders. Just an hour on the water will do a lot for your upper body, naturally. Disc golf offers a cheap and fun way to get exercise in with friends competitively. The equipment for disc golf typically runs about $10, and if you need to pay for using a course, it runs less than $10, usually. Some local parks offer free use of the course and other locations devoted exclusively to such games charge. With those details out of the way, learn all about the health benefits of playing disc golf. Depending on how far you throw the disc, you put much energy into the throw, using your arms, shoulders, back, and core. As you navigate the course, your body moves across various types of terrain which works out your whole body. For an 18-hole course of disc golf, estimate 920 average calories burned for two-hour play time. Imagine the changing leaves in a blur as you zip by on your mountain back. Jump over streams and use your calves to power yourself up the hill. In combination with the beautiful scenery, you’ll forget your burning muscles and how fast time flies — just like you! 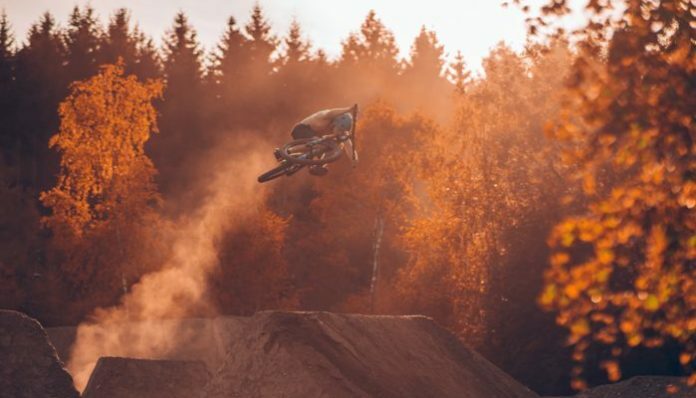 Depending on how strenuous the ride, an hour-long mountain biking adventure can knock off a little over 600 calories for a 160-pound person. Compare running on land to water running when you burn 11 calories per minute underwater compared to the eight per minute striking your foot against pavement. You may have seen individuals on NBC’s “The Biggest Loser” trying this out in a specialized exercise pool, but you can give it a whirl in your pool or the community pool before it closes. The resistance will force your muscles to work harder, and it’ll improve your balance. Stick to the three-foot area for safety. Gather up some friends and grab your ball of choice for soccer or flag football. You’ll use all kinds of muscle groups when you play touch sports. Consider developing your own training program for a big game with everyone, with pull-ups and full range squats, and increase your odds off burning off more calories and winning! Head out for a scenic drive in the country, hop on a horse to exercise those leg muscles and learn a new thing. Don’t think it’s exercise? Think again — staying balanced on a horse requires you to use major muscle groups in your legs and core. Horseback riding for an hour burns a little under 300 calories when you alternate walking, trotting, long trotting, and cantering. Many holistic businesses or wellness practitioners offer free community outdoor yoga or tai chi classes. Search your city’s events online or call up a few yoga studios and ask around. Nothing on the radar? Get involved with creating one in your area. Yoga works out the whole body, and tai chi’s slow movements help you focus on mindfulness while tending to the smallest of muscles. These practices are especially good for balance and flexibility. Don’t get so caught up in the end-of-summer blues that you miss out on the fun of fall. The cool air will keep you alert and make it easier to breathe through your workout. What unique exercises are you interested in doing this fall?